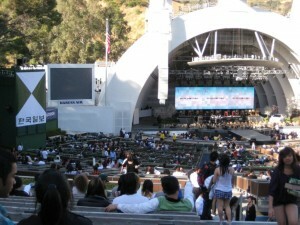 Saturday April 30, 2011 at the Hollywood Bowl is the ninth annual Korean Music Festival showcasing some of the best talent in the county such as Sul Woon-Du, U-Kiss and 4Minute just to name a few. The all-star line up is bridging the gap between the generations with the wide mix of performers this year. From traditional singers to teen idol groups the Korean Music Festival is sure to engage the audience no matter who’s in attendance. This is a great family affair and a night to be remembered among the Korean population and others in the Hollywood and Los Angeles regions. Set in the Hollywood Bowl which is known for its social gatherings in Southern California and home to many classical, jazz and Broadway musicals, the Korean Music Festival brings the sounds and sights to life of the Korean culture and atmosphere. Started in 2003 the Korean Music Festival was introduced by the Korean Times, the leading news organization in the Korean American community. The goal was to commemorate the centennial anniversary of Korean American immigration to the US. This type of large scale event had never been attempted before from this organization and it quickly became a local and national event. Every year the festival out-does itself from the previous year and current expectations. When the Korean Music Festival began in 2003 there were over 18 top rated artists from Korea which quickly produced a sold out show selling over 18,000 tickets in just two weeks. The community and local business support and sponsorship keep the festival rising to new heights every year with sold out shows every year. The Korean Music Festival is something to be enjoyed by Koreans and non-Koreans alike with globally renowned artists like BOA, Rain and DJ Doc.